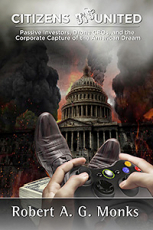 Citizens DisUnited: Passive Investors, Drone CEOs and the Corporate Capture of the American Dream is an indictment of corporate executives divert shareholder assets to undermine democracy and enrich themselves, putting both capitalism and democracy at risk. Once again, Monks lays bare the problems of governance and government -- problems that are undermining our democracy and creating a system controlled by CEO kings. He calls out the perpetrators by name and gives specific fixes that must be done -- immediately. Far too much of American business is being run for the personal enrichment and glorification of its manager-kings. This book shows how that happened and unveils, for the first time, a new study showing that corporations "un-owned" by their shareholders -- corporate "drones" -- are far worse corporate citizens and have significantly lower average shareholder returns than firms in which owners still exercise authority over management.